Is Bosley the new Downs? And Meinke the new Bosley? Think about it. Meinke is the new Finn after basically running the same time as a sophmore in perhaps rougher conditions. You can even argue meinke is the next downs as I don’t think downs was this good at 3200 this young although did make nationals in cross as a sophmore similar to Baby boz. Baby Bosley we can’t define him yet, this season doesn’t really count given it’s a 5 week season but of course he still just won a medal and ran 9:17 so he made it count. I don’t think Andy boz was pushing downs as meinke is pushing Bosley already as a sophmoree, took a little longer for the rivalry to form if I remember right. (Junior year). In fact I ran with downs once in August of his junior year and he didn’t know who Bosley was which I found amazing if true. Hopefully one of them is the new state record holder next year. Different, but related question: when will Bosley change his race strategy? Or should Bosley change his race strategy? I was implying that Phil Downs was the dominant person in all his races from freshman year (4:20/9:18/15:53) onward much like Drew Bosley (4:17/9:21/15:50s) whereas Meinke (9:44 freshman) was like Andy Bosley (about 9:44) as a freshman. Meinke beat a 90% Bosley 9:09 to 9:17 yesterday. It starts with Phil Downs who was the runner up at state cross country in 1988 and ran 4:20/9:18 freshman in the spring of 1989. It looked like he was going to be a high school prodigy. Phil Downs won xc as a sophomore (1989) but was hampered in the 1990 track season after TFA. 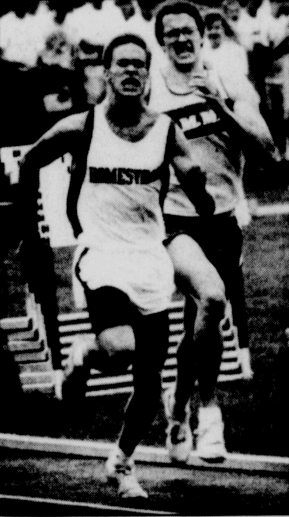 Andy Bosley took him down in the 3200 as a junior at state which was significant because it showed the rest of the state that Phil Downs, while a major beast, was not invincible. Downs, now a two-time state champion in cross country, was surprised in the final 175m by Bosley’s kick. Downs prevailed in the 1600 the next day. But then Bosley took him down twice at state as as senior in both events. An epic showdown in both races with Westosha’s Tony Escarcega sneaking past Downs in the 1600 as well. I think Downs ended up a 5-time state champion including cross country and Bosley a 3-time state champion all on the track. Phil also did really well at TFA most years. I think after seeing Drew run the mile he wasn’t near 90 percent. Hard to be good in track without a base. Either I’ve lost it (very possible) or this isn’t right. I don’t remember Bosley competing with downs in 1990 in track. Downs may have been injured but Bosley wasn’t quite a star yet (good just not a state champ star yet) I am pretty sure in the fall of 1990 before cross country started downs did not know who bosley even was. I missed 1991 track due to college etc and knew about the epic 1992 races but I think 1990 was off or I have just wiped 1990 out of my mind for selfish reasons but I’d be shocked I don’t remember bosley winning state that year. Either I’ve lost it (very possible) or this isn’t right. I don’t remember Bosley competing with downs in 1990 in track. You’re right. I have it mixed up. Downs did not compete in the outdoor season state meet. It happened the next year. Downs had the fastest season time (9:08) coming in but Bosley beat him at state in 3200 on the first night. Downs took the 1600 the next day with Bosley back in 6th. Nope. 3200 was super slow. All the times on that day were slow and way slower then the times Friday probably due to weather/wind etc. 100 200 800 3200 4x100 4x400 (3:16s was night before) hurdles etc. (100 meter champ could probably run .8 faster which is a lot), every half milers who placed had run 1:55s already. the only reason I am pointing this out is it shows you how good brian jones record was although for some reason I believe I remember that 47 seconds things may have cleared up a little. He just blasted off best race off his life including his time as a badger. He is still the class A record holder despite losing the state record. And it may last longer as I don’t see a 46 runner in class a currently (maybe the oak creek sprinter) on the imminent horizon after threats the past 2 years and he ran that on a very slow day in track and field. Just joined recently and saw this old thread. I was also class of 1992 and raced against Downs and Bosley (was not at their level, but they were good to have in races because my 16, 32 and XC PRs all came in races they won). I knew Phil from summer track in middle school. He showed up and ran something close to 4:40 in the mile at an 8th grade meet, completely destroying the rest of us and giving a taste of what was to come. I remember he was coming off being hurt in track his sophomore year but raced anyway on short fitness, so that is why he didn’t win anything in track that year. I’m pretty sure his junior year 9:08 referenced above came at Monona Grove, where he soundly beat Bosley (I was in that race much further back). No idea whether Phil knew who Bosley was at that time. Without the internet, things were very different. You saw who you raced head to head and whatever area results were in the paper, but nothing like today where everyone instantly knows everyone else’s results. If Easton can run 1:52 he might make Bosley the new Downs and he himself the new Bosley.